Unfold your sartorial elegance in this black saree enhanced with abstract design on it. 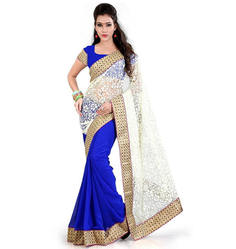 Poly Georgette Blue Beautiful Lace Border Saree With Embroidered Unstitch Blouse. 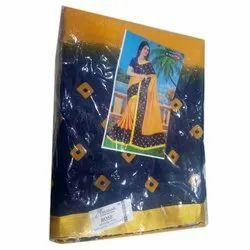 To meet the variegated requirement of experts in our team, we are engaged in proffering best array of Party Wear Silk Saree. They are available in many colors. Captivate everyone with your striking sense of style and sophistication with this Alluring Marron and Steel coloured Satin Chiffon Saree. Its Attractive Sequence work, Thread work and Stone Work is distinctive of all. It will carry Golden coloured Brocade Embroidered Blouse.